Shredding is a dangerous behavior that dogs may exhibit when left alone. As a responsible owner, you want to give your dog a comfortable space to sleep, which can become difficult if he tends to shred everything he gets his paws on. You can find options for bedding that are both comfortable and durable. Do not give your dog anything containing foam or made from thin fabric. Fabrics like cotton and suede are easy for dogs to rip through. Also, never substitute carpet squares or blankets for dog bedding. Dogs can easily tear off pieces of blanket and carpet, ingest them, and become ill. While you are searching for safe bedding, remove all bedding from the kennel and just use the plastic flooring that comes with kennels. A puppy may simply grow out of shredding, but a full-grown dog will require you to alter your own behavior. 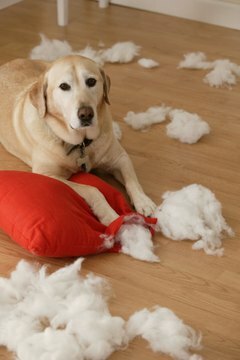 It is dangerous to allow a dog to continue on this destructive streak. Do not coddle your dog before putting him in the kennel or before you leave home. Ignore him if he whimpers as you leave. Keep plenty of toys around and praise him when he plays with them, this will alleviate another cause of shredding: boredom (see Resources). Playing the television or radio while you are away may also help. No one type of bedding is completely indestructible, but vinyl comes close. A variety of companies produce safe vinyl bedding, and some will even replace the bedding if your dog is able to chew through it. Vinyl pads are only about an inch thick but still offer a moderate level of cushion and support. Some vinyl pads give you the option of tying it down to the kennel itself; this allows you to keep the pad strapped on to the kennel, offering another level of security. Nylon is one of the toughest fabrics available for dog bedding. Cordura nylon in particular is widely used because of its intense durability against chewing and its ability to hold up after multiple cycles in your washing machine. Reputable companies are using cordura nylon in their dog beds. Nylon offers more versatility than vinyl because it is more pliable and can be stuffed with plush, pillow-like materials for extra comfort. Carolina Arana has been writing professionally since 2003. She has been published online and in "Cypress Dome," as well as academic research conducted for the University of Central Florida and various private companies such as Leading and Learning Inc. Arana is a graduate of the University of Central Florida with a bachelor's degree in English and a minor in biology. What Do You Line the Bottom of a Ferret Cage With? Do Mesh Kennels Work as Well as Metal Kennels? What Goes in the Bottom of Horse Stalls?